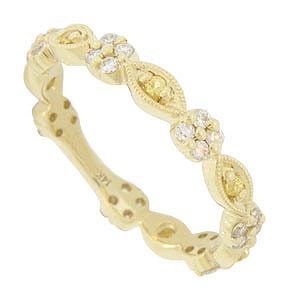 This romantic wedding band is a golden garland of dancing flowers. Each delicate bloom is set with a quartet of round faceted diamonds. 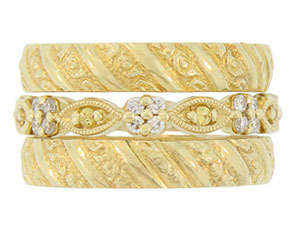 Elongated leaves set with single faceted yellow diamonds separate the sparkling blooms. Photographed with stackable wedding bands WB1919 (sold separately). 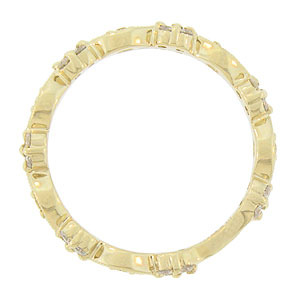 The antique style wedding ring is crafted of 14K yellow gold and set with .50 carat total weight of round cut diamonds. The ring measures 2.94 mm in width. Size 5 1/2. We can re-size slightly or reorder in other sizes.